Half & Half Linguini uses half “real” noodles and half zucchini noodles for a tasty treat with less calories. Plenty of fresh herbs – mint, dill, and parsley – brighten things up along with the briny capers which are fried until crispy. This recipe for Half & Half Linguini grew out of my love to eat a massive bowl of pasta and my need to make myself feel not so guilty for piling it all in there. I mean, my bowls of pasta are never petite… Massive is more the word for them. 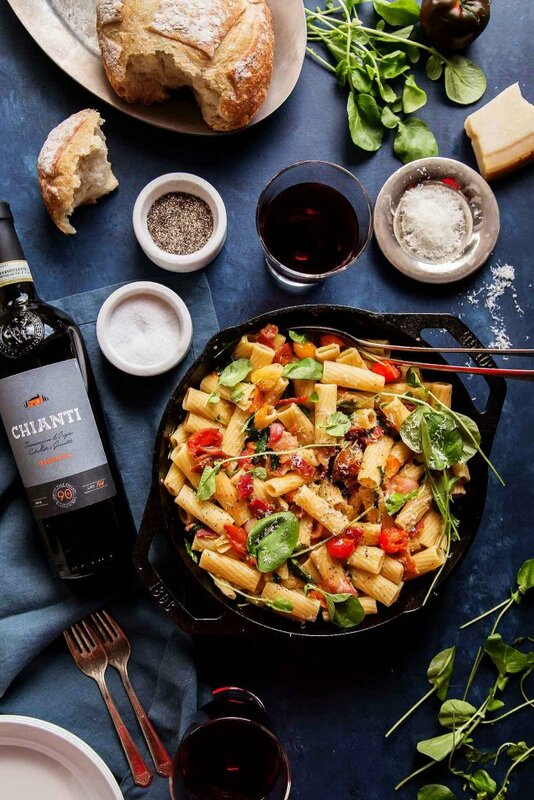 This yummy pasta goodness is dressed simply. I tossed the linguini and zucchini noodles with plenty of fresh herbs (dill, mint and parsley), some fresh grated parmesan and some quick, crispy fried capers. The herbs brighten everything up while the parmesan gives a nutty quality and those crispy capers finish it all off with a salty, briny quality. Be sure to save some of the starchy cooking liquid from your pasta pot. It will help add body to the dish and will help to steam the zucchini noodles. 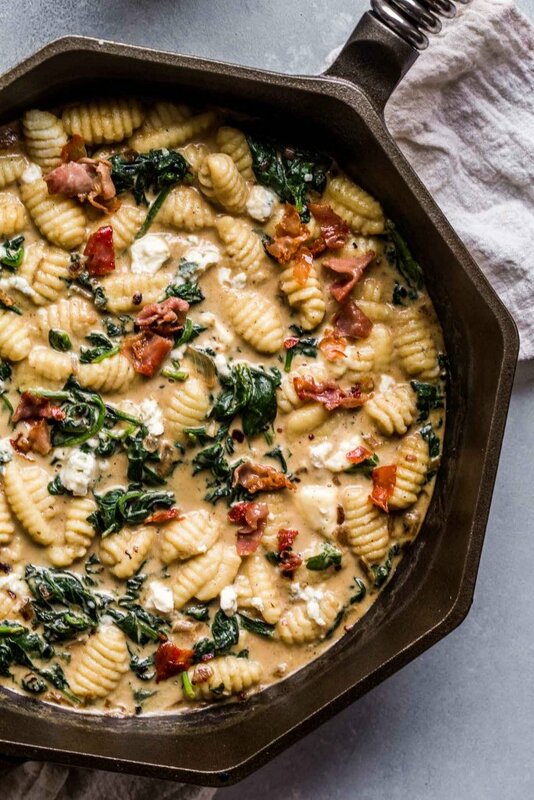 Stir it all together with a bit of butter and let it get nice and creamy with the parmesan. I think you’ll be obsessed. Bonus that this recipe takes less than 30-minutes from start to finish. Use a julienne tool. For quite a while this was my preferred method. The tool is about the size of a potato peeler and works in a similar fashion. Use a knife. Just thin slice slices horizontally and then slice those slices into long thin strips. Use a spiralizer. This is my new preferred method. I just got this spiralizer attachment for my KitchenAid as a wedding gift and I’m totally obsessed with it. I can spiralize three zucchini in less than 2 minutes. If you don’t have a KitchenAid, there’s also this spiralizer that gets great reviews. 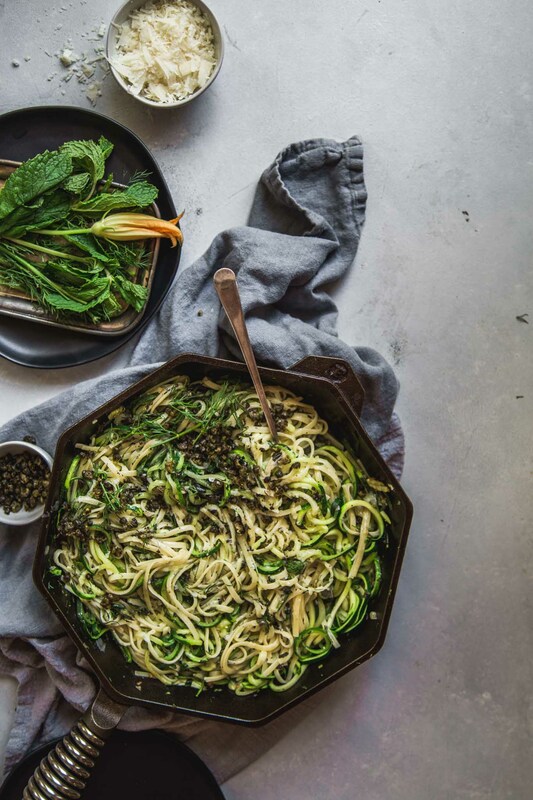 How do you Cook Zucchini Noodles? I prefer to quick-saute zucchini noodles for just a few minutes. In this recipe, I saute them in a skillet with a bit of olive oil, garlic and red pepper flakes. Then I add in the “real” pasta and a splash of the cooking water which helps them steam a bit further. This can be a personal choice too. You may prefer your zucchini noodles al dente, which would only take about 1 minute, or you may like them on the creamier side, which would be about 3 minutes. I tend to like them on the rawer side, plus they reheat better this way too. Can I use all Zucchini Noodles in this recipe? Sure! 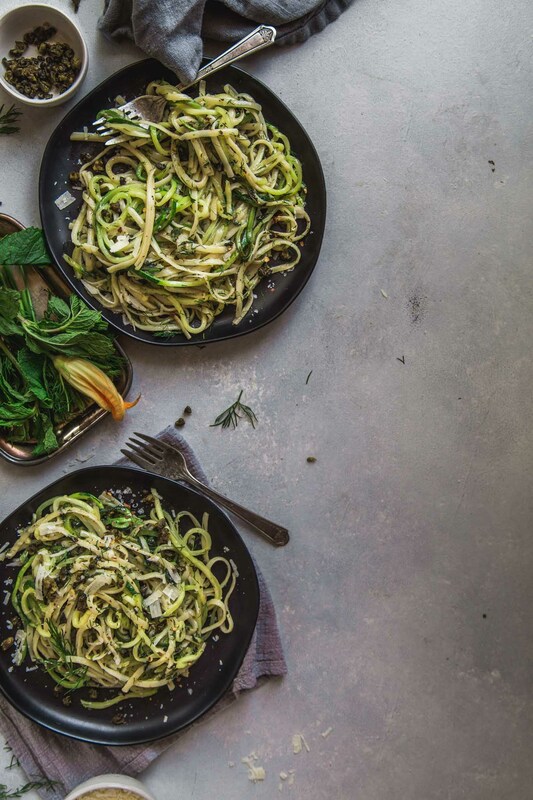 If you prefer to leave the carbs out completely, you can use all zucchini noodles. I would add in four more zucchini to make up for the “real” pasta in this recipe. I would also add in about ¼ – ½ cup of water as the zucchini sautes to help it steam a bit. This Half and Half Linguini uses half "real" noodles and half zucchini noodles for a tasty treat with less calories. Plenty of fresh herbs - mint, dill, and parsley - brighten things up along with the briny capers which are fried until crisp. Julienne your zucchini using your preferred method. 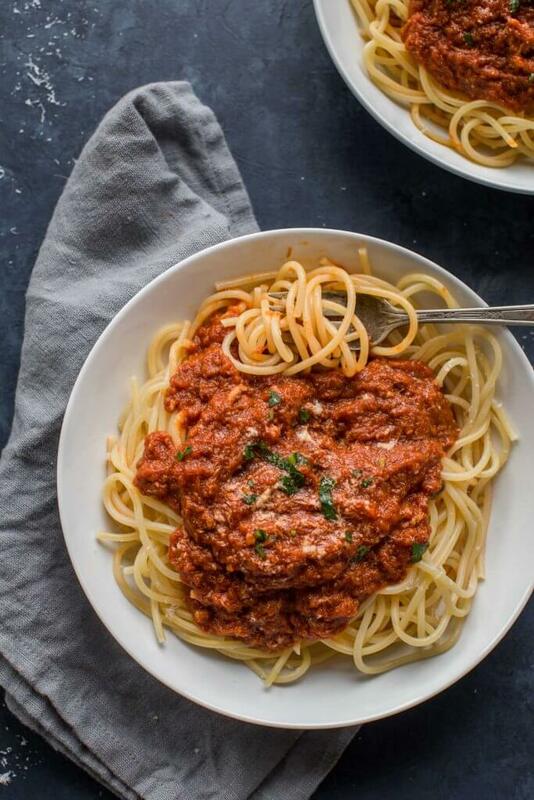 Cook the pasta in boiling, salted water according to the package instructions, then drain in a colander, reserving a little of the cooking water. While the pasta is cooking, heat 2 tablespoons of the olive oil in a large frying pan over medium heat, add the capers, and cook until crisp. Remove with a slotted spoon and place on a paper towel to cool. Heat the remaining tablespoon of oil in the pan, and cook the zucchini, garlic, and pepper flakes, until just tender, 1-3 minutes. Toss the zucchini with the drained pasta, along with the herbs. Season with salt and pepper. Add the butter, 1/4 cup of the reserved cooking water, and half the cheese and mix well. Serve immediately, sprinkled with the remaining cheese and fried capers. 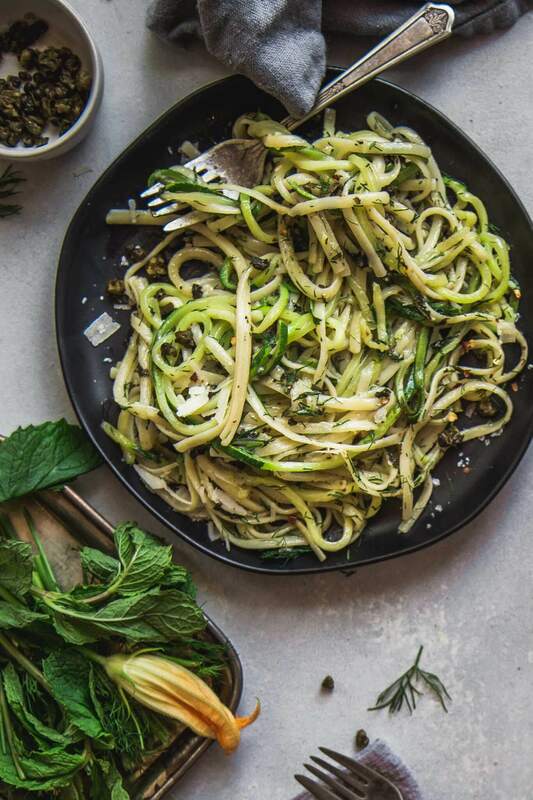 If you loved these zucchini noodles with fresh herbs I would appreciate it so much if you would give this recipe a star review! Also, be sure to snap a picture of your finished dish and share it with me on Instagram using the hashtag #platingsandpairings and tagging me @platingsandpairings. Try pairing this dish with a creamy, buttery Chardonnay. Prosecco is also a great match with this dish. Its effervescence pairs nicely with the salty capers and creamy parmesan. I teamed up with Divine Flavor to bring you this post. As always, all opinions are my own. This recipe was originally published in January 2015. It was updated in August 2018 to update the photographs and content. The recipe remains the same. I have a bit of an addiction to this dish and to RH! Thanks Melissa – My favorite part is that you can eat a whole bunch and not feel like you’re in a “food coma” afterwards! So many great ideas in here. I love the half and half fettuccine and zucchini noodles and then fried capers is truly the icing on top! Kelly – Those fried capers… SO good. I have to keep myself from eating them all before they actually make it onto the pasta! This is fantastic! I have had a hard time with the zoodles trend so I’m loving that you did half and half. i think I can definitely get on board with that! Thanks Kim! It’s a great way to get the texture of “real” carbs, but sneak some veggies in there as well! Yes! I LOVE pasta – too much, I think 😉 and one of my favorite take-out dishes is a seafood dish with half pasta noodles and half zoodles. 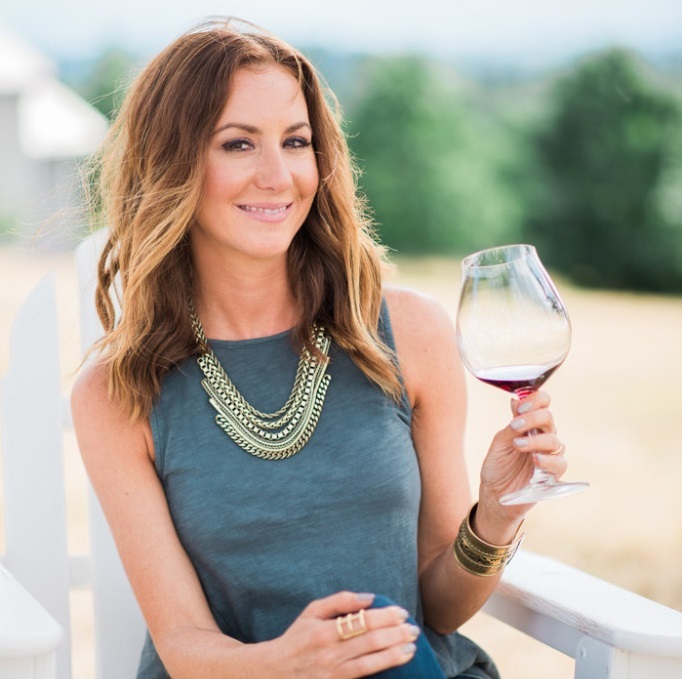 Such a great recipe, Erin! Loving the combo of herbs you used too – so flavorful! Such a great idea to do half pasta, half zoodles! It’s the perfect balance between food coma and not quite satisfying enough. Also, I love fried capers — yum! This sounds really tasty!! I’d be very interested in trying this sometime. I made zucchini noodles once but I wasn’t super impressed because it just didn’t hit the spot. Never thought to do a half & half version. It’s a great way to sneak in some extra veggies Jay! How brilliant to make this dish half-and-half! It looks super tasty and its a great way to cut some calories and get some extra green veggies! I love that you mixed 1/2 and 1/2! I’ve never thought of that, but will definitely do that next time! Yum! I want a massive bowl of this half and half noodle too! I’m all about a HUGE bowl of noodles Tina!